Preparing for an English language examination and memorizing words and their attributes can be a Herculean Task for anyone. But in this era of smart on-the-go devices, how can we not find an app that can raise our proximity to the expert level of the language. I found one- LingoDiction SAT, an app by MediaAgility. Let me elaborate on a few points why this app is among my favorites. It is more than a dictionary or thesaurus. This app offers the meanings, synonyms, antonyms, usage, origin and root for more than 6000 words. It was amazing to find out even the most unusual words. You can quiz yourself. Set the number of questions you want to take under the category of your choice and get quizzed! The app maintains a scorecard of your performance, which can pride or embarrass you later on. Play games. I fell into nostalgic state when I played the 8 mini-games including Scramble, Match it, Guess the Word and Army of Synonyms. It is a unique combination of education and entertainment. You test your English vocab while games maintain the thrill. Share your scores. I flaunted my quiz scores on my facebook timeline. You can do the same. However, you need to score first. Wink! It’s user-friendly. 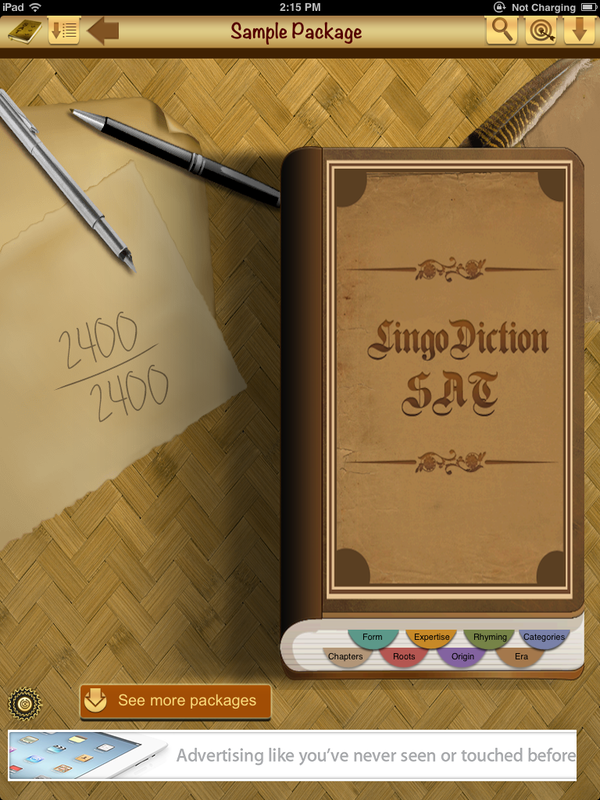 Unlike any other app, LingoDictionSAT never takes its users as already the master of language, it respects new users. With uncluttered interface and help screens, it was easy to sail across the first time. 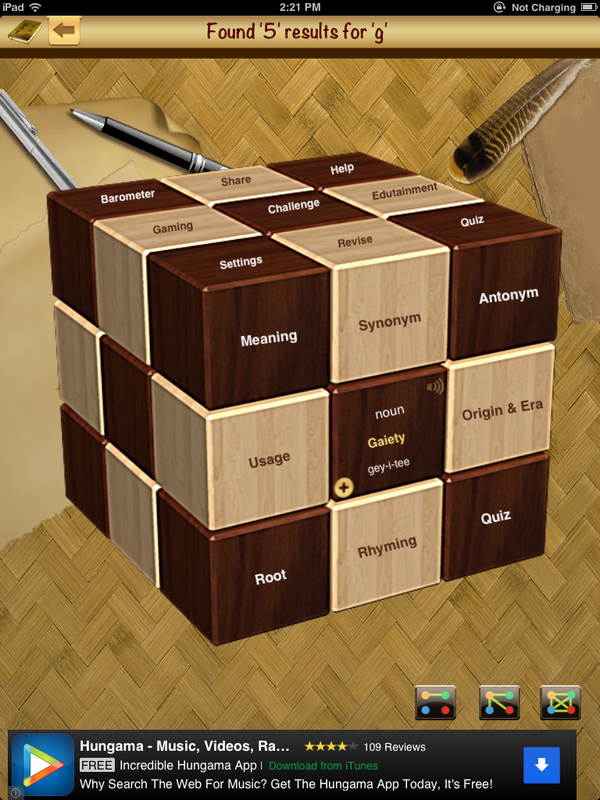 The combination of book and cube in one app emits that required touch of Edutainment. Edutainment, I believe is the best theme to facilitate learning process for any living being. I can practice English language for as much time as I want. The boredom and monotonous text would not be able to bother me anymore. It is preparation for any exam in USA, UK, Australia or Canada, I know I can practice English for hours. While I am using this app for IELTS, my friends are using it for SAT, TOEFL, GRE and GMAT. If I don’t like anything in LD SAT, want to offer suggestions or feel like adding my knowledge to the app, I can do it! There is a feedback option that keeps me satisfied that this app is for our personal convenience. The words I have found difficult, the words I often forget and other important words can be stapled in self-fabricated categories. This allows me to keep those words handy for future reference. Hence, LD SAT became my ideal SAT tutor. I get an option to download 3 types of packages with 2,000 words each. Seldom do we find such a vast English tutorial, which has a plus point of interactivity. I keep on adding words to my vocab, so that I can score better in English games. The more I score in English vocab games, the more I am assured of my performance in entrance examinations. English language learning has indeed been made easy by LingoDiction SAT. I can leave my English vocabulary worries on this app.